This is Mr. Young’s official statement as sent to me by Lookout Management a division of Warner Brothers Records. It bore the subject line “Official Neil Young Statement from Lookout Management”. My comments begin below the press release. Yesterday my song “Rockin’ in the Free World” was used in an announcement for a U.S. presidential candidate without my permission. I am Canadian and I don’t vote in the United States, but more importantly I don’t like the current political system in the USA and some other countries. Increasingly Democracy has been hijacked by corporate interests. The money needed to run for office, the money spent on lobbying by special interests, the ever increasing economic disparity and the well-funded legislative decisions all favor corporate interests over the peoples. The Citizens United Supreme Court ruling is proof of this corruption, as well as the proposed trade deals, which would further compromise our rights. I choose to speak Truth to this Economic Power. When I speak out on corporations hurting the common man or the environment or other species, I expect a well-financed disinformation campaign to be aimed my way. That’s why it’s crucial we all get engaged and get informed. I do not trust self-serving misinformation coming from corporations and their media trolls. I do not trust politicians who are taking millions from those corporations either. I trust people. So I make my music for people not for candidates. Mr. Young says first and foremost that he is Canadian. Mr. Young does not dispute “Rockin’ in the Free World” was properly licensed. Simply, that had he known Mr. Trump was going to license the song he would not have granted his permission because of a disagreement over political views between himself and Mr. Trump. More importantly, Mr. Young goes on to speak directly about legal and political issues that are firmly based in the United States of America–Not Canada. The Citizens United case has zero legal bearing in Canada. It was a case argued before the United States Supreme Court and only effects US law. Perhaps Mr. Young would be wise to instead reference a Canadian Supreme Court case such as Harper vs. Canada and the Canadian Elections Act. The Harper case in 2004 upheld that spending limits by third party groups can be limited and does not violate Canadian law. Mr. Young speaks about “Freedom of Choice” is this a veiled reference to Roe v. Wade? If so shouldn’t Mr. Young have instead spoken about R v. Morgentaler which held abortion to be legal in Canada? Or, are we to just assume that it is in reference to choices in general? Maybe Mr. Young is speaking to Freedom of Choice in consumerism. Such as his hawking of a doomed music device. Mr. Young goes on to speak about Vermont (Also not in Canada) and a GMO labeling law passed which allows people to know how their food may have been made. Is Mr. Young aware that Canada does not have any national requirement for the labeling of GMOs? Why is a proud Canadian citizen not speaking about law that would effect him directly? Why is Mr. Young ranting on about a law that has no bearing on his life in Canada? Is it because Mr. Young likes to hide behind being Canadian when it is convenient? Mr. Young has lived in California for close to 50 years. He has been a driving force behind The Bridge School in Hillsbrough California which his now ex-wife founded in 1986. Mr. Young pushes his new album The Monsanto Years in his letter. An album that could have been recorded anywhere from Prince Edward Island to Vancouver Island. Yet, it was instead recorded at a theater in Oxnard, California which is most definitely not in Canada. The Monsanto Years was released by Reprise/Warner Brothers Records (owned by private equity group Access Industries) which is a large American Corporation. The kind Mr. Young claims to be fighting against. As a side one should note Access Industries holds industry leading companies in gas, oil, chemicals and industrial metal production. The kinds of “economic power” Mr. Young is attempting to “speak truth” to. Yet he is happy to be in bed with for his own personal gain. 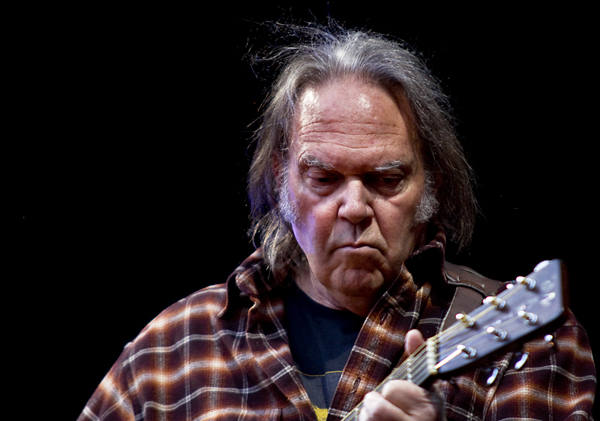 My missive here asked more questions about Neil Young than he would be willing to answer. It is not meant to impugn but rather to simply point out that artists like Mr. Young rarely speak in an honest manner in statements they make and more often than not their statements are filled with contradictions, half truths and efforts to appear holier than thou. If Mr. Young doesn’t want people to see his hypocrisy he should stick with his toy trains like a good Canadian boy rather than make comments regarding US law and US affairs.